Feeling simultaneously exhausted and fabulous, after three hours of sweating, stretching, and strengthening in Bikram and Hot Vinyasa Yoga, I reminisced on a conversation that took place thirty-five years previous. At that time, I was a self-conscience, overweight, horse-crazy tween. As I sat inside the viewing room at Overlook Farm on Vly Road in Niskayuna, NY, I heard, “Susan, if you ever want to compete at a higher level, you need to lose weight. You are just too heavy. You have to be athletic and fit to ride well”. The man spoke with candor, his delivery sincere and caring. I reacted with eyes opened wide, not in disbelief, but rather in an effort to hold back a fountain of tears. I had never thought about my weight in relation to riding, nor what I ate and its accumulated affect on my body. The man speaking to me was Neal Shapiro. 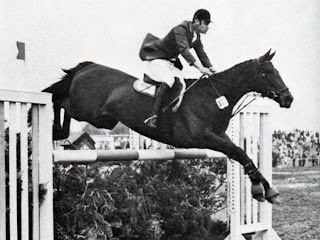 Most people recognize Neal for his incredible achievements on horseback, which include two wins of the Aachen Grand Prix, and two Olympic medals in Munich in 1972. I had the privilege of riding with Neal for several years. He taught me more about horses than any other coach. However, even more significant, he revealed the critical importance of being just as fit as my horse. A profound truth echoed by George Morris and Anne Kursinski. It was after a lesson one day that Neal beckoned me for a face-to-face meeting. Other than jeers from schoolmates, no one else ever mentioned my weight. To this day, I ask, why not? Mother and Grand-mother fed me a steady un-portioned diet of Kraft macaroni and cheese and pistachio pound cake; all of it, the entire box and the whole cake! No wonder I was FAT! Thanks to Neal's talk, I embarked on a fitness program. I started running, eliminated desserts and bread. It was very hard at first, but I managed to lose over 35 pounds. This transformed my teenage life, back at school winks and whistles replaced searing comments. In the saddle, I experienced the real value of heeding Neal’s advice. I had added strength and agility. With a newly discovered confidence my riding improved and the horses were happier too. I could fill a book with Neal's teaching. His uncanny accuracy in articulating the most minute detail to improve rider-horse relations made even frustrating lessons a pleasure. My muscle memory, while on a horse, is all Neal. He has accompanied me on 1000s of rides. So when you spot Neal in the schooling area -- listen in and you'll hear pearls of wisdom you can apply to your ride. The greatest lesson Neal shared didn't come to me on horseback. It was the life lesson he taught me at age 12 sitting in a chair. Every day when I work out, I appreciate even more deeply the fact that Neal cared enough to take the time to speak with me about such a sensitive matter. His words changed my life forever, and, for the better. To find out what you can learn from Neal Shapiro, watch part one of his interview on Unbridled online, and tune-in to HRTV Thursday at 10 PM ET for part-two taped at HITS-on-the-Hudson. UPDATE: Neal resides in New Jersey with his wife Elisa, together the operate Hay Fever Farm. In 2010, Neal was inducted into the Show Jumping Hall of Fame, and in July 2013, Neal will travel to Israel as the US coach for competitors in the Maccabiah Games. Copyright 2002-2015 Unbridled TV | ALL RIGHTS RESERVED |. Simple theme. Powered by Blogger.